A brush fire prompted voluntary evacuations and road closures as it burned 200 acres in Montebello Sunday afternoon. One person was arrested in connection to the blaze. 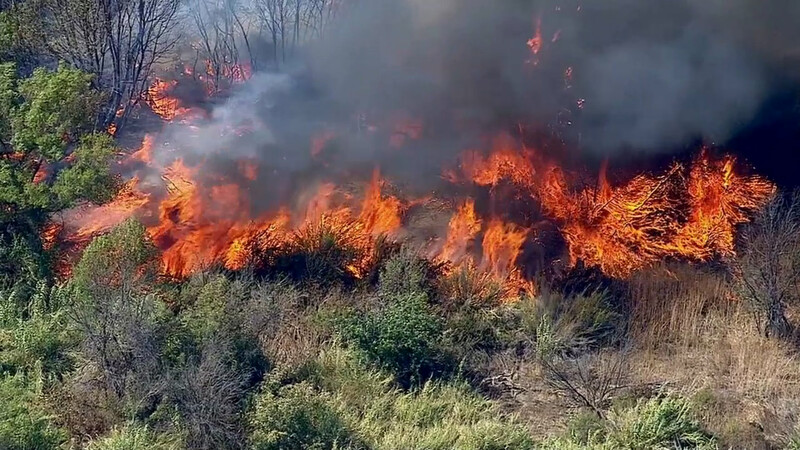 MONTEBELLO, Calif. (KABC) -- A brush fire prompted voluntary evacuations and road closures as it burned 200 acres in Montebello Sunday afternoon. The fire, which broke out along the 900 block of North Lincoln Avenue, burned more than 50 acres on the eastern and northern side of the hills. The fire sparked a second blaze that burned more than 80 near San Gabriel Boulevard by the intersection of Lincoln Avenue. By Sunday night, the blazes were about 20 percent contained. Residents in the area saw plumes of smoke just before 2 p.m. The fire had spread quickly through the Whittier Narrows Recreation Area and transformers near the flames blew up. Authorities said 45-year-old Arturo Aguilar was arrested and booked at the Montebello police station on felony suspicion of unlawfully causing a fire. He was taken into custody around 1:30 p.m. near Lincoln Avenue, just south of San Gabriel Boulevard. He was walking and had left an area where the fire initially started. Police believe arson may be the cause of the blaze. His bail was set at $35,000. A brush fire scorched hillsides in Montebello Sunday afternoon, prompting precautionary evacuations and road closures. Legg Lake and shooting range areas in Whittier Narrows, south of San Gabriel Boulevard, were evacuated. Voluntary evacuations were ordered for 33 homes on Muscatel and Hazel avenues and Darlington Street, all south of San Gabriel. One firefighter suffered heat exhaustion and was taken to a nearby hospital. At least 100 firefighters from Los Angeles County, Montebello, Monterey Park, Monrovia, Arcadia, Pasadena, South Pasadena, Glendale and San Gabriel fire departments were at the scene. Lincoln Avenue between Rea Drive and San Gabriel Boulevard was shut down due to the blaze. Eastbound lanes of State Route 60 at San Gabriel Boulevard were shut down until 8:30 p.m. The fire resulted in power outages in the city, affecting 314 customers. By 4 a.m., 62 people were still without power. Southern California Edison did not have an estimate for when power would be restored to customers. A Los Angeles County Fire helicopter made an emergency landing at Rose Hills Memorial Park and Mortuary while attempting to assist in the firefight. One firefighter suffered minor injuries during the hard landing and taken to an area hospital. Two others in the helicopter were not injured, fire officials said.